I get this a lot "How can I open and edit PDF files without having to purchase a costly application like QarkXPress"? Before OpenOffice extensions came about my answer to that would be "Not easily". But now, thanks to a very useful tool created by Sun, editing a PDF file is as simple as adding an extension to OpenOffice and then opening that PDF for editing. Update: The plugin is no longer compatible with recent versions of OpenOffice. 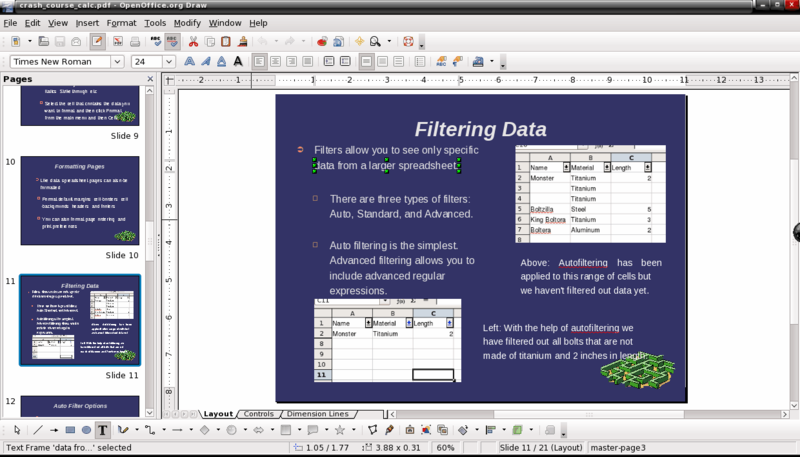 The OpenOffice spinoff LibreOffice supports the editing of PDF documents. Check out Using LibreOffice as a PDF Editor for instructions. What should be apparent from the above lists is that the Sun PDF import extension supports primarily the more simple PDF documents. Once a document gets complex, this extension may or may not work. The Sun extension works with all platforms of OpenOffice. So no matter if you are using OpenOffice on Linux, Solaris, Windows, or Mac you will be okay. To install this extension go to the project page and scroll down until you see all of the "Get It!" buttons. Here you will click on the button that corresponds with your platform. When you do this a dialogue box will open asking you what you want to do with the file. If you are offered to open the file with OpenOffice do so. If not just save the file. If you are able to go with the former option the OpenOffice extension installer will automatically open up. This is very much like installing an extension in Firefox. You simply have to OK the installation. Unlike Firefox, however, you do not have to restart OpenOffice. If you had to save the file, never fear, all you have to do is open up OpenOffice Writer, go to the Tools menu, and select Extensions manager. When the manager opens click the Add button, navigate to the directory you saved the extension file in, and click Open. 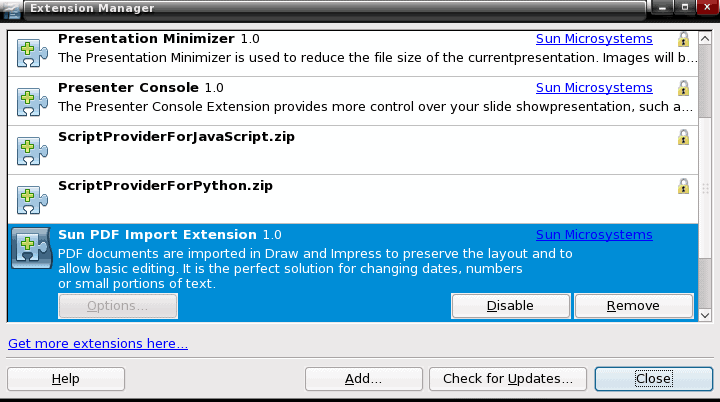 Once the extension is installed you will see it listed in the manager (see Figure 1). When you open up a PDF document OpenOffice will open the document in OpenOffice Draw. With your document opened in this application you will be able to edit the various elements of the document. Figure 2 shows a PDF document (that was actually exported from a presentation document) opened in Draw (with the help of the Sun PDF Import Extension). In this image you can see a text element ready for editing. To edit a text element you simply double click the element to make your edits. If you right click an image you will see a menu that includes entries for various arrangments of the image, cropping, and converting. You can convert embedded images into different types of objects (Polygons, Contour, 3D, 3D Rotation File, or Metafile). When you go to save your document, if you want to save the document as a PDF you have to use the Export to PDF and not Save As. If you want to save the document in one of the supported OpenOffice Draw formats you can use Save As. I do a lot of PDF documents. Some times I get requests to alter PDF documents and now, thanks to Sun and OpenOffice, I can take care of those requests. Granted I can not use this tool with more complex documents, but for more simple PDF files this tool is magic. not as powerful as Acrobat, but no software to install so very easy way to edit PDF files for free. Two other resources for pdf editing are Inkscape (what I currently am using and have been for over a year) and KOffice. The latter I have only tested once and it did okay. I really like the way Inkscape handles PDFs and have not used the OpenOffice extension much. Thanks for the reminder to check it out. This extension has another great feature: hybrid PDF/ODF documents. The document can be exported as a fully legal PDF with the original ODF file embedded for later editing. It is the perfect file format: cross platform and easy to browse when reading, yet editable in it’s native application. this extension still has much limitation. Works very well (so far) on pdf created by OOo. http://www.pdfescape.com worked well for me. I used it for first time, to edit a rebate form. Only used its TEXT insertion function. More additional functions available. Easy to use.